Customized solutions can be provided as per the dairy’s individual requirements due to the modular nature of Promethean’s Milk Chillers. Customers require solutions for high quality of milk, managing the chilling centre under extreme conditions of stress or even just eliminating diesel to reduce their carbon footprint. Promethean’s systems can be mixed and match and also combined with existing equipment of the customer to obtain and ideal solution which is both Capex and Opex friendly. Single phase connection at farms. Grid power is extremely unreliable in some parts of North and East India. In summer the outages can be as high as 20 hours/day. The summers are also extremely hot with temperatures regularly exceeding 40o C in the months of May and June. Running a Diesel Generator to chill milk at the collections centres under such conditions is extremely costly due to the high consumptions and energy required. Diesel also has the added complexities of handling (transportation from the pumps to the chilling centres), fumes and pilferage. Mother Dairy wanted a solution which could rapidly chill the milk under these extreme grid conditions. The solution must be able to store energy during the limited period of grid availability which could then be used to chill the milk. 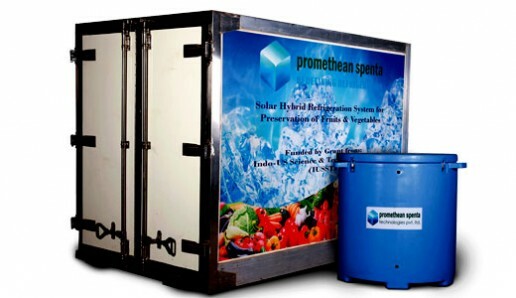 Mother Dairy presented the problem to Promethean Power Systems and asked us to create a solution. After several tests and iterations of various combinations of our Thermal Storage System we were able to present Mother Dairy with a solution, that not only worked with limited grid but also rapidly chilled the milk. The solutions works with 2 units of the Thermal Storage Battery coupled with a higher powered compressor. The high capacity of the compressor ensures that both the both the Thermal Batteries are completely charged within 4 hours. The cooling capacity of the 2 Thermal Batteries is between 100 to 1300 litres of milk when fully charged. The Rapid Milk Chiller was also included in the solution to enable Mother Dairy to collect very high quality milk. The technical team of Mother Dairy was satisfied with the results and have procured 2 units for field trials.